In August 2017, we released a new ShipStation integration that is more reliable and provides more options than our legacy ShipStation integration did. This guide covers the new integration settings and features. If you are using the legacy integration, upgrade to the new integration at your earliest convenience following the instructions in this guide. The legacy integration has LEGACY written in the logo. After creating a manual store in your ShipStation account following the instructions in the ShipStation setup guide, you can adjust the details about how Order Desk handles your ShipStation orders, starting with the Setup and Advanced Settings sections. Choose which folder orders should be moved into after they are sent to ShipStation from Order Desk. Choose which folder orders should be moved into as shipments are added to them in ShipStation. Choose which folder orders should move into if they are canceled in ShipStation. The Store dropdown displays all the stores in your ShipStation account. Select the manual store you created following the steps in the ShipStation Setup guide. Do not select a store which connects to another integration or to the store being used with the Legacy ShipStation integration if you still have that enabled on your Order Desk store. If every one of your orders will be sent to ShipStation, enable the Automatically Send Imported Orders to ShipStation setting. Orders will immediately be sent to ShipStation as they come into Order Desk. If only some orders need to be sent to ShipStation, keep this setting disabled and use the Rule Builder to tell Order Desk which orders are meant for ShipStation. By default, all discounts will be sent to ShipStation as adjustment line items. If you do not want discounts to be sent to ShipStation, uncheck the Send Discounts to ShipStation option. Discounts must be over $0.01 to be sent. If you would like Order Desk to check twice a day for canceled orders, check this option. If any are found, they will be moved into the folder specified in the If Canceled, Move To setting. 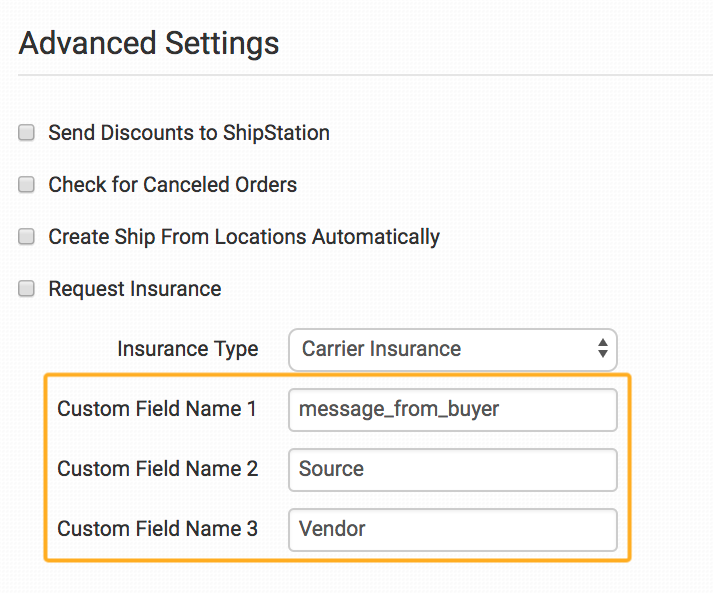 With this option enabled, if your orders have return addresses set in them, Order Desk will check ShipStation to see if a ship from location (formerly warehouses) exists for the name in the return address title. If it doesn't exist, it will be created and set for the order. Check the Request Insurance setting if you want to use insurance. If selected, choose which option you want from the Insurance Type dropdown. Options are Carrier Insurance and Shipsurance. 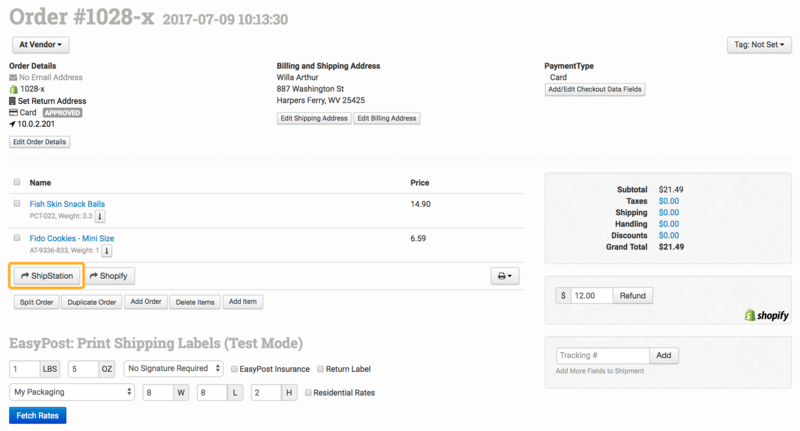 In ShipStation, you can add custom columns to your orders to display specific information from Order Desk. In some cases, checkout data is added to an order automatically from certain shopping carts, but it can also be added with a rule or added manually by an Order Desk store user. Use the checkout data field names that you want to pass through to ShipStation, such as "gift_from_buyer", "Vendor", "Source", or whichever custom field name you may have on your orders. Order Desk can send certain custom values to ShipStation. BillToParty Identifies which party to bill. Possible values: "my_account", **"my_other_account", "recipient", "third_party". If not entered, we will not pass this field. If you enter BillToMyOtherAccount, we will automatically fill this out properly. If you enter a BillToAccount value, we will also fill this out properly. BillToAccount or ShippingAccount Account number of billToParty. If not entered, we will not pass this field. BillToPostalCode Postal Code of billToParty. If not entered, we will not pass this field. May be required if you are using third-party UPS. BillToCountryCode Country Code of billToParty. If not entered, we will not pass this field. BillToMyOtherAccount When using my_other_account billToParty value, the shippingProviderId value associated with the desired account. If not entered, we will not pass this field. If entered, we will set BillToParty appropriately. Hardcode a specific store ID for this order so it will go to this store in ShipStation. WarehouseID Hardcode the Ship From location for this order. For help with the Bill To Details, please see the ShipStation API documentation at this link. Order Desk can send certain custom values for order items to ShipStation. The Product Code Match feature allows you to tell Order Desk when certain product SKUs need to be changed before orders are sent for fulfillment. Add one match per line with bundles separated by commas. For more information on how to set this up, see this guide. To prevent certain products from being sent to ShipStation, add their SKUs to the Product Code Skip field, one SKU per line. For more information, please see this guide. To send gift messages through to ShipStation, add the checkout data field name for your gift messages in the Gift Message Field box. To add a note on the picklist, fill in the checkout data field on your orders that you want sent to ShipStation in the Picklist Message Field. This will be added to the Customer Note field in ShipStation. The Inventory Location Match field lets you match the inventory location set on your inventory items. Only items with the same inventory location name that is set in this field will be submitted to ShipStation. Shipments should come back into Order Desk automatically as orders are updated with tracking details in ShipStation. However, you may find on occasion that some orders fail to pull in their shipments. If this happens, you have two quick options to find the shipment. First, you can click on the Check ShipStation For Shipment button in a single order to find the shipment. Alternatively, if you have a larger number of orders that are missing their shipments, scroll down to the bottom of the ShipStation integration settings page and look at the Shipment Check Tool. Select the folder your orders are in and click on the Check All Orders For Shipments button to search the entire folder for shipments.